Enlarge / A launch-day photo of Starman leaving Earth orbit. 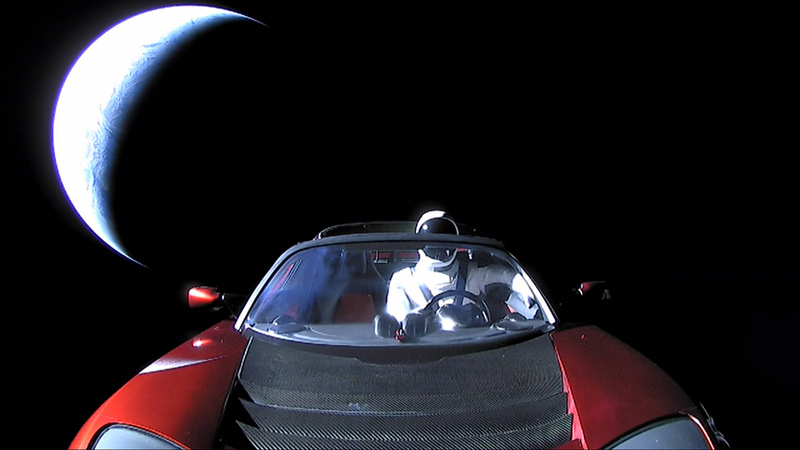 Since its launch on February 6 atop a Falcon Heavy rocket, Elon Musk’s cherry-red Tesla Roadster and its “passenger” Starman have been moving away from the Sun. According to Ben Pearson, who runs the site, the Tesla’s position should be accurate to better than a day, but it is impossible to know for sure. The data on the Tesla’s orbit comes from NASA and tracking by ground telescopes for the first six weeks after launch when the Falcon Heavy’s upper stage, and the Tesla, were still relatively close to Earth. After the first few months of spaceflight, only the Hubble Space Telescope could track the Roadster. This instrument, which recently returned to service after a gyroscope problem, can see down to the 30th magnitude, which is a measure of an object’s brightness. The “Where is Roadster?” website projects the path of the car through space. The orbit is based upon data collected during the first six weeks of the Tesla’s flight. It is “probably” still accurate to within a day. The car’s apparent magnitude is now about 30. That is right at the limit of even the Hubble Space Telescope. But the Hubble won’t waste its time on this. It has real science things to observe. Such a magnitude is extremely faint, about 1 billion times more so than an object visible to the naked eye. Seeing the Roadster at its present distance, just outside the orbit of Mars, is similar to Hubble spying a dark, 15-km-wide lump of rock in the Kuiper Belt, which is outside the orbit of Neptune. Alas, Hubble will not be spending any time trying to find the Roadster. “Hubble orbits are precious and highly competed for, and so it would be a waste of scientific time to devote the resources to look at it,” Ray Villard, news director for the Space Telescope Science Institute, told Ars. The images in the gallery above show some highlights in Starman’s expected orbit, including a pass to within 0.05 AU of Mars in October 2020 and a pass relatively close to Earth in November 2020. That latter movement should allow some ground-based telescopes to observe it again. How Does Final Fantasy IV Stand Up Today?